Now I have been having terrible luck finding the Hourglass Ambient Lighting Palette, but if you are lucky enough to spot one, purchase it! It is the perfect palette for any high-end beauty lover. Don't worry though if you are like me and can't find this limited edition must-have, giving one of the single ambient lighting powders would make a great gift as well. Diffused Light and Dim Light are universally flattering options. The Too Faced Pretty Rebel palette came out a few months ago and has a gorgeous mix of neutrals and colours, mattes and metallics. An eyeshadow addict could create a ton of different looks including the perfect New Year's Eve make-up. The Tarte Off the Cuff Blush palette is another hard to find item, but I spotted a few at a Sephora last week. Tarte's blushes are amazing and to have four shades and one bronzer all in one handy little palette is a wish come true. Speaking of blushes in a handy little palette....this brings us to the Nars One Night Stand blush palette. This palette contains six total colours, four blushes, a bronzer, and a highlight in a mix of popular shades and new releases. And finally the top of my personal wishlist, Urban Decay's Naked 3 palette. I love my Naked palettes, and the rosy tones of the latest edition would fit perfectly amongst my collection. I don't really need to tell you why this makes the perfect gift, do I? Now head to your local Sephora (don't forget to use that $15 off promo that's sitting in your inbox!) and pick up some gorgeous palettes for your friends, family, and of course, yourself! 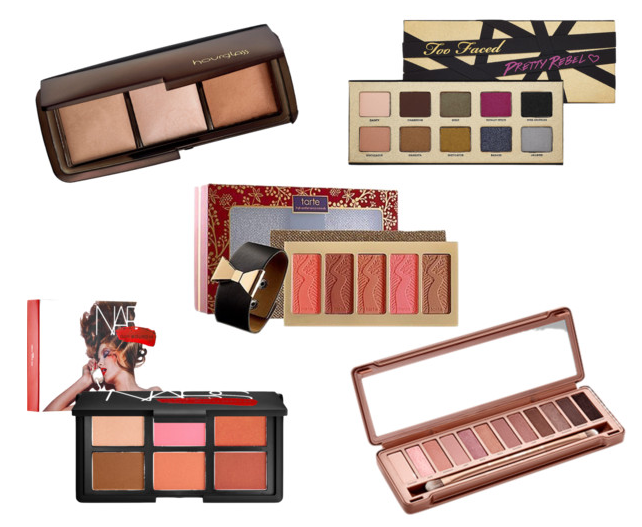 What are some of your favourite palettes this year? I really want that ambient lighting palette, but I'm also having a hard time getting it. I'll probably call my local Sephora every day until it comes in. Sounds like a plan!! I have been walking into so many Sephora's so many times searching for it. I hope it's not gone for good!